President Barack Obama and his wife Michelle Obama, started a new tradition in 2009 the “Kid’s Inauguration Ball”. 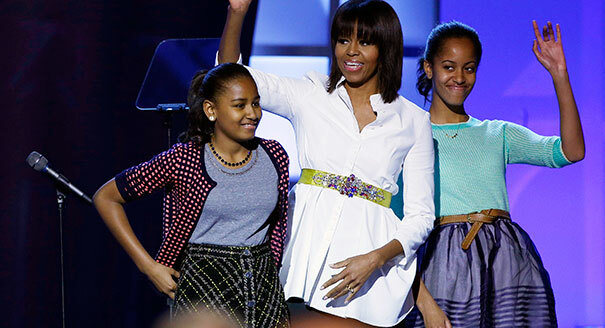 Over 5,000 military families and Washington D.C. school children had a fun Saturday night for the kids’ inaugural ball at the Washington Convention Center. Hosted by First Lady Michelle Obama and Dr. Jill Biden the Children’s Ball honors military families of the Joining Forces charity. Nick Canon was the night’s MC and Usher Raymond opened the event. Other mega performers were Illuminate (America’s got Talent),Mindless Behavior, Soul Children of Chicago,The cast of Glee and pop star Katy Perry. Check out the media gallery for great pictures of the big event. This entry was posted in Celebrity, Events, style and tagged barack obama, Children's inaugural ball, J.R. Martinez, Jill Biden, Katy Perry, Kids inaugural Ball, malia obama, michelle obama, mindless behavior, music, Nick Canon, sasha obama, style, Usher. Bookmark the permalink.